Attack of the advanced heart-rate monitors! Like we reported last year, built-in optical heart-rate monitors are ubiquitous these days. Every activity tracker and sports watch seems to have one. This trend continued in 2018, but one thing that changed is that advanced sports watches and other devices started pushing the capabilities of heart-rate monitors to new heights. 2018 saw the introduction of the Polar Vantage V and Vantage M, two advanced multisport GPS watches that both feature elaborate 9-LED optical heart-rate monitors. They boast an accuracy of plus or minus 1% and have dedicated sensors that detect skin contact. In addition to the ambitious HRM, the Vantage V model is also the world's first sports watch that includes a built-in running power meter. 2018 also brought the first major redesign of the Apple Watch with the new Series 4 models. While they don't look that different, their screens are now 15% larger. 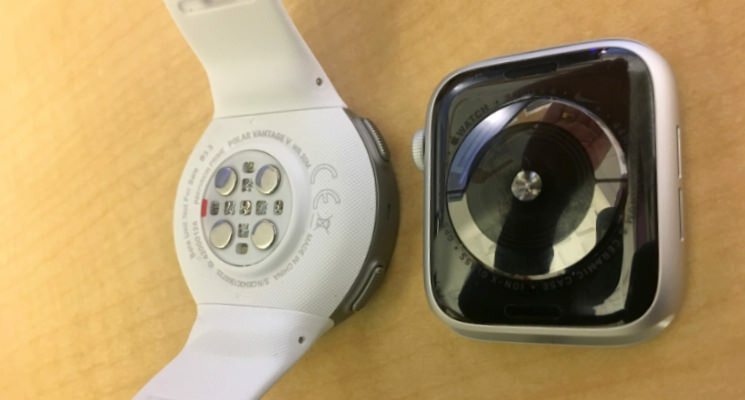 The built-in optical heart-rate monitor was redesigned, but the overall approach of utilizing green LEDs to measure workout HR and infrared LEDs to measure 24-hour HR is similar. The Apple Watch typically misses the first 30 to 60 seconds of heart-rate data in a workout, but once it's on it delivers impressive accuracy. The improvement likely has more to do with software, as Apple appears to be utilizing their new machine learning framework for HR tracking in watchOS 5. When older generation Apple Watches get updated to watchOS 5, they see improvements in HR accuracy as well. The Series 4 Apple Watch also features dedicated electrodes for giving yourself electrocardiograms. This feature has only rolled out to the US so far, but it's a compelling advancement nonetheless. While not nearly as comprehensive as the multi-sensor EKG machines used in medical facilities, the Series 4 is capable of detecting atrial fibrillation, which can lead to stroke and heart failure. A pretty neat feature from the same little gadget you can use to send duck emojis to friends. On the topic of interesting 2018 heart-rate monitors, it feels necessary to mention the Scosche Rhythm 24. This is an HRM that straps to your forearm, tricep or bicep as opposed to your chest or wrist. This year's Rhythm 24 model builds on the popularity of the Scosche Rhythm+ model, which was known as one of the most accurate HRM's around. Both the old model and the new Rhythm 24 feature Valencell sensors, but the technology in the 24 is 5 years younger, making it even more precise and efficient. The new Rhythm 24 model provides 24-hour battery life (up from 10), an array of LEDs that provide battery life and zone information, onboard memory for recording workouts without a watch or while swimming, dual ANT+ and Bluetooth Smart connectivity, various sport modes, running and cycling cadence tracking, a dedicated app for configuring, HRV monitoring and integrations with HRV4Training and Elite HRV, an improved arm-strap and more. Music + Spotify finally arrived on Garmin watches! Runners who never wear headphones during workouts did not get excited about this next piece of news from 2018. This year not only did Garmin finally start releasing watches with onboard music storage, but they also officially integrated with Spotify. This scratched two major itches for runners who like to rock out: you could finally run with a Garmin and listen to music without needing to bring a phone or another music playing device, and you could finally sync content from the world's most popular music service. The first Garmin watch that featured music storage, playback, and Bluetooth headphone connectivity was the Forerunner 645 Music, which was announced back in January. Over the summer Garmin announced the Fenix 5 Plus line, which also featured music capabilities. Spotify integration didn't arrive until early October for the Fenix 5 Plus, then in late October it came to the 645 Music. We're still waiting for the Spotify integration to trickle down to the Vivoactive 3 Music. While we're on the topic of Garmin, it seems fitting to mention their Varia RTL510 Radar rear bike light, which came out in 2018. It's similar to their first-generation Varia radar bike lights, but this year's model greatly improved the design. Instead of needing a light and a separate radar sensor, both units are now integrated into a single device. If you're not familiar, the Varia radar lights communicate with your bike computer or sports watch to alert you when a vehicle is behind you. They let you know how many vehicles are behind you, and how quickly they're approaching. It's pretty amazing tech. Want a power meter with that? The Polar Vantage V multisport watch wasn't the only device that shipped with a built-in power meter in 2018. The factory-integrated power meter trend reached the world of cycling as well. This year big brands like Specialized and Giant started including power meters as stock parts of high-end bikes. The Specialized power meter is extremely similar to the 4iiii Precision, a low-cost power solution that has a reputation for accuracy. The two companies have a partnership, which explains the likeness. The origin of the Giant power meter is more mysterious. It's a dual-sided solution with pedal balance metrics and cadence. These offerings are more about bike upsells than anything else. If you're buying a new superbike, it may as well come with a built-in power meter, right? The idea of getting a new bike that comes with a power meter out of the box is a nice idea. No fussing with chain rings, pedal swapping, or worrying about crank arm clearances. However, there's something comforting about carefully choosing a reputable brand and model to put on your bike. Is Garmin's most advanced running watch worth it?